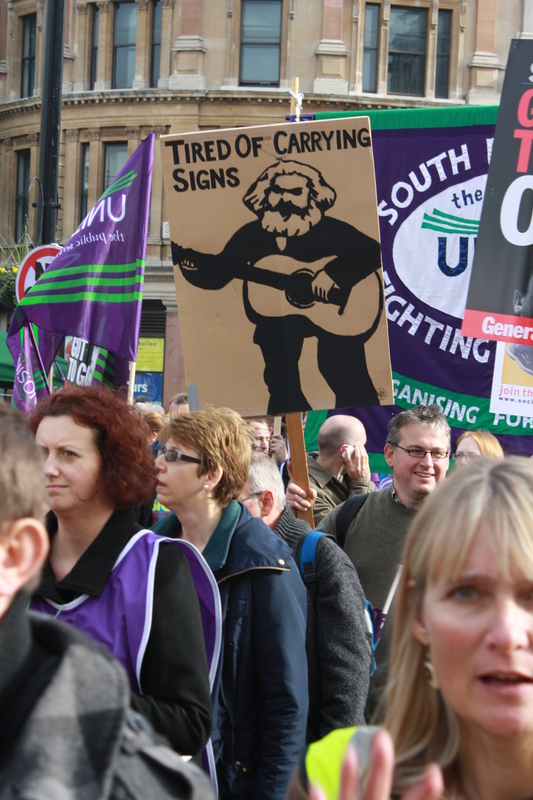 The TUC rally ‘March for a Future that Works’ on 20 October was really heartening. To see such a massive number of people – tens of thousands of ordinary workers from across the country marching side by side with families and kids, older people, disabled people and students – all taking to the streets of the capital to loudly and firmly voice their opposition to the Government’s plans was really encouraging. It showed what we all know, that support for Government policies of privatisation, more inequality and more austerity for the many is paper thin. Even worse, this Government’s policies are prolonging recession, making life harder for ordinary people across the country. It took well over 3 hours for the march to go past Trafalgar Square where these photos were taken. Pictured here is just a tiny sample of the people that marched by and, in particular, their banners. Later on at the rally in Hyde Park, Dave Prentis, UNISON General Secretary, began by saying that David Cameron and Nick Clegg are forming a boy band called No Direction. But on a more serious note, he pointed out that inequality is at levels not seen since Victorian times. He went on to say, “If there is money available to bail out the bankers, there is money available for the NHS and our schools and to get young people back to work. “Today we march – tomorrow we march on. “We march for decent pay that people can live on. We march to defend the NHS. We march to defend our community services. We march for a future that works. “To the Tories we say: ‘Hands off our public services, they are not yours to destroy’. The TUC general secretary Frances O’Grady told the crowd, “Thank you for marching today in your tens of thousands. Thank you for standing up against the tax dodgers, the greedy bankers and this government. “Join me in sending them this message: ‘End this austerity’. At the Conservative conference, Cameron said he wanted to spread privilege. We know what he is spreading – and it doesn’t smell good!